Anyone else think Charles Dickens novels or Victorian times? That’s what popped into my head back in November when Matthew posited that my psoriasis was, in fact, chilblains. 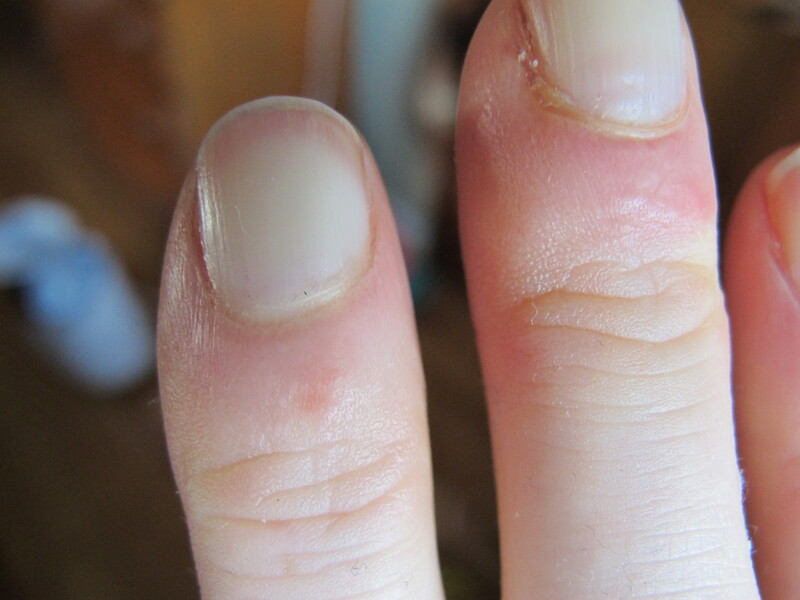 For a bit of back story, I’ve had something wrong with the fingers on my right hand for three winters in a row now: red, scaly, itchy skin and blisters. This started in 2013, the winter I was unemployed and home with Gabriel (the timeline will be important later), reoccurred last winter, and is back for more fun this year. In 2013, a dermatologist diagnosed the issue as eczema, wrote a prescription for topical steroids, and sent me on my way. The steroid cream had little effect, and the issue cleared up in April, when the cold temperatures ceased. Same story last year, except I skipped the dermatologist and changed my diagnosis to arthritic psoriasis, based on the joint pain I was experiencing in the affected fingers. Psoriasis is an autoimmune disease and can be triggered by stress. There is evidence that people suffering from psoriasis benefit from mindfulness practice (in conjunction with light therapy), and so, while I didn’t want to get my hopes up too much, I was hoping that my fingers would benefit from my mindfulness practice this winter. My hopes were dashed when we had the very intense cold-snap in early- to mid-November. Almost immediately, I started seeing the first signs of trouble on my fingers. Not only had the problem returned, it was starting months earlier than before. This winter, I’ve kept it from getting worse by applying shea butter mixed with a bit of vegetable glycerin. 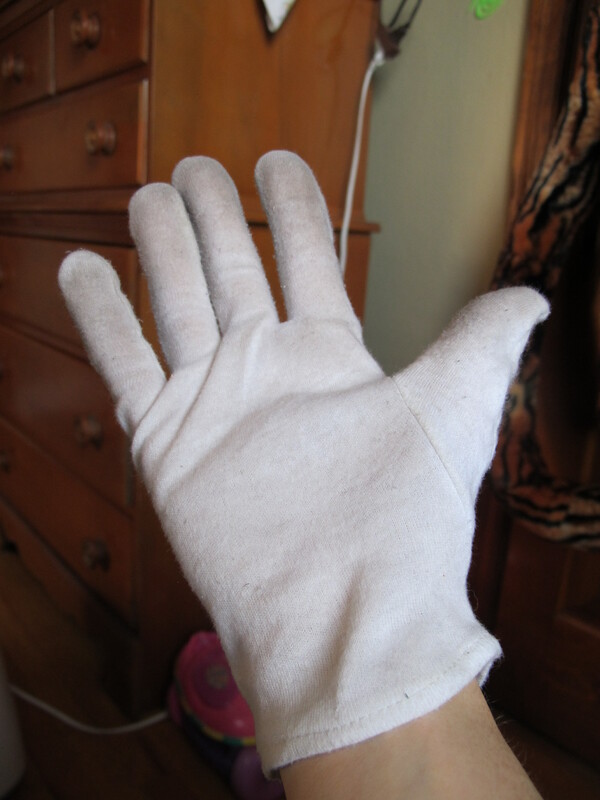 Then, to keep the lotion from getting everywhere, and to keep my fingers warmer, I wear a thin cotton glove (I recommend these from CVS vs. the similar option from Walgreens, which are too small and cost twice as much, though both developed holes after just a few wash and wear cycles). While the cotton glove offers a bit of prevention and protection, the shea butter is just treating the symptoms. I’ve also been very diligent about wearing rubber gloves anytime my hand would be getting wet — dishes, general kitchen clean-up, scrubbing vegetables, cleaning the bathroom, washing my hair, doing laundry, etc. — and wearing good mittens when I’m outside. After November’s cold snap, December was relatively mild, and, combined with my shea butter and cotton glove regimen, my fingers were in pretty good shape, and I didn’t give Matthew’s chilblains diagnosis (nor his urging that I keep the thermostat set higher during the day time) much more thought. And then it got colder and stayed colder. And I thought back and realized that my finger problem started the first winter that I was home all day (vs. in an office), and continued the second winter when I was working from home, and continues now (still working from home). The common denominator seems to be, you guessed it — home! Home, where I sit at the computer in 64° F temperatures every day (sometimes I get crazy and turn it up to 66° F for a bit). Sixty-four is not bad if you’re up and moving around, but for just sitting, even wearing relatively warm clothes, it’s pretty chilly. So I am finally, reluctantly, experimenting with somewhat higher daytime temperatures in the apartment. I don’t like the higher thermostat settings for environmental or financial reasons (this definitely goes in the “Not Green” category), but I also just don’t like the way all of that forced-air heat feels. Even running a humidifier, it feels like it’s sucking the moisture right out of me. Blech! On the other hand, it would be nice to live without grumpy fingers, so I’m going to give the higher thermostat settings a try, at least for a few weeks. Also, although it’s hard to believe, sitting here on the coldest day of winter (so far), spring IS right around the corner, so one way or another, this should clear up relatively soon. Maybe next winter I’ll be able to head it off entirely! *While the chilblains diagnosis fits, what I do still find odd is that this seems to affect my right hand exclusively. I’m not complaining that both hands aren’t affected, but it does seem odd that the left hand is spared. This entry was posted in Health, Not Green. Bookmark the permalink. Very interesting… I had no idea that chilblains were an actual medical thing, I guess I just thought it was a fancy word for being cold! Have you tried hand warmers? I have a similar though different problem with my toes – they turn white and go numb at the slightest provocation. But I find if I warm them periodically throughout the day I do much better. Generally this just means putting my toes on Princess’ heating pad which lives under my desk – or using a microwaveable heating pads when I’m on the couch. But I’ve also taken to soaking them in warm water and it makes a HUGE difference. Don’t know if that would work for you since it sounds like the problem happens from the warming, but I sure hope you find something that helps because it doesn’t sound like much fun! I’m just reading your story now. I’m going through a remarkably similar experience to yours right now. After years of believing that the dermatologist was correct in her diagnosis of Chilblains, today a rheumatologist diagnosed me with Psoriatic Arthritis. I am positive for some symptoms I wasn’t even aware of along with a family member with the diagnosis. However, my chief complaint is fingers on my right hand that swell in the cold damp weather. Can you give an update on your condition? Thank you. Sorry for the delayed reply. I just wrote a long reply that WordPress ate 😦 Summary: my issues seem very connected with temperature, so I think it is not psoriatic arthritis. This winter was my best since I started having this issue. I was really proactive about keeping my hands protected and warm as soon as it started to get at all chilly. I also kept up with some vitamin and mineral supplements — not sure if that factored in or not.